June 10, 2015: A program illustrating many graphic manipulation effects in Delphi was posted 12 years ago. It was largely written by a young Czech programmer, Ivan Sivak, who I'm sure has moved on to bigger and better things by now. I made only minor changes to his code before posting it. A fix was posted today in the Contrast/Brightness section of Graphic Effects correcting a problem of white or light gray pixels displaying as black..
June 17, 2015: A License Key Generator program was posted several months ago to explore how unique keys might be generated to allow a program to verify owner or expiration date information. To my surprise, the program was recently flagged as a "Keygen Trojan" by a well respected security scanner. I revisited the source code and made a few formatting and spelling enhancements and the warning disappeared. So, just in case, I reposted the License Key Generator V1.1 program today. 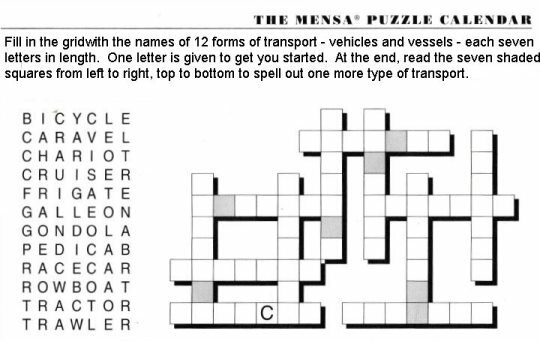 June 29, 2015: Acrostic Variation, posted today, implements a solver for this Mensa® calendar puzzle from March 16, 2015. It uses a search technique probably used by most human solvers; concentrating on the word intersections to find candidates; the program just does it a lot fasterJ.